Old Spice Scented Geranium (pelargonium fragrans 'old spice') - Similar to Nutmeg in appearance. Spicy scented leaves with hints of ginger, cinnamon, and nutmeg. Rounded gray-green leaves with sprays of delicate white blooms. Mounding and trailing habit make this a good choice for containers and hanging baskets. Culinary. 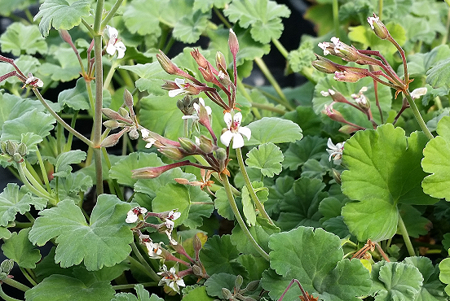 Like all pelargoniums, requires a well drained soil and sun. Perennial zones 9-11 Live Plant in 3 inch container.